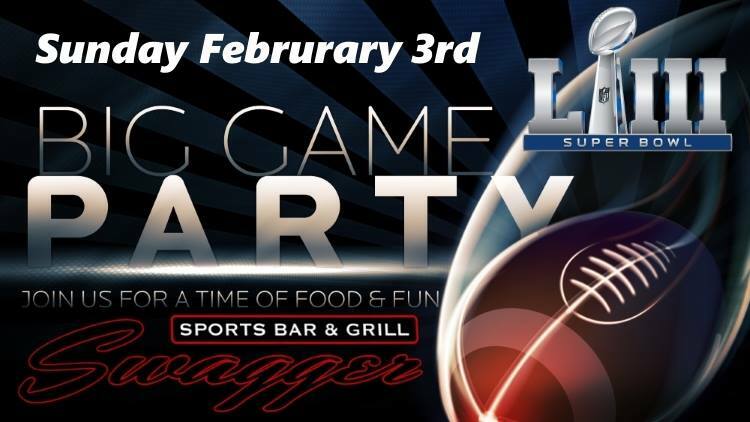 Join us @ Swagger Sports Bar and Grill this Sunday @ 5:00 PM to watch SUPER BOWL LI! Join us @ Swagger Sports Bar and Grill this Sunday @ 1:30 PM to watch our Green Bay Packers take down the Atlanta Falcons in this NFL Divisional Playoff event! Join us @ Swagger Sports Bar and Grill this Sunday @ 3PM to watch our Green Bay Packers take down the Dallas Cowboys in this NFL Divisional Playoff event! Join us @ Swagger Sports Bar and Grill this Sunday @ 3PM to watch our Green Bay Packers take down the New York Giants in this NFL Wild Card Playoff event! 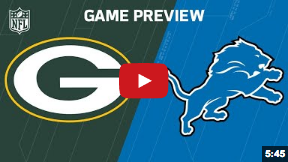 Join us Jan 1 for a 7PM kickoff, Lions vs. Packers! Another Great Event happening at Root River Center! Everyone is welcome to come out and enjoy some great beers and support a great organization! See You October 8th! 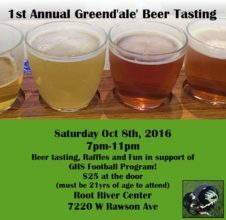 Beer tasting, Raffles and Fun! Money raised to support the GHS Football Program! $25 at the door – must be 21 to attend. Details still shaping up but we want to do a Lambeau trip in September. Check back often for additional details! On Saturday, August 27th, Franklin Junior Football will welcome guests to our inaugural Kountdown to Kickoff fundraising event! Business leaders, parents and community members will enjoy a great evening of food, live music featuring highly acclaimed Failure to Launch, auctions and games while raising funds to support Franklin Junior Football! 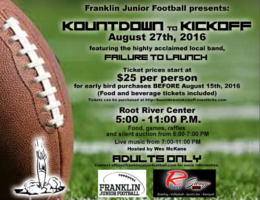 Kountdown to Kickoff will be held outside at the Root River Center in Franklin from 5:00 – 11:00 PM. Food, games, raffles and silent auction from 5:00 – 7:00 PM. Bags Tournament starts at 6:00 PM. Live Music from 7:00-11:00 PM. Don’t forget to purchase your tickets by Monday, August 15th before ticket prices increase! For every ticket purchased you the 15th, earn a chance to win a $50 Kwik Trip gift card! Winner will be drawn at event! Ticket prices include food and beverage tickets. This is an ADULTS only event!